Solid tumors are diagnosed by the formation of a group of abnormal tissues that do not comprise of any cyst or liquid areas within. Solid tumours is classified into two types in medical terms, i.e. benign (non-cancerous) as well as malignant (cancerous) in nature. Solid tumors majorly comprise of lymphomas, carcinomas, sarcomas and melanomas; whereas, all forms of leukemias usually do not cause solid tumor formation. Hence, most of the solid tumors are treated via radiotherapy, chemotherapy and/or surgery. Chemotherapy is often utilized along with other modes of solid tumor treatment i.e. radiation and/or surgery. Globally increasing instances of solid tumors is expected to drive the demand for solid tumor market during the period of study. Geographically North America dominated solid tumor market driven by best in class infrastructure, best in industry practices and higher spending by the citizens towards healthcare expenditure. North America was followed by Europe and Asia-Pacific as second and third largest market for solid tumor market. Asia Pacific is projected to have fastest growth, owing to rapidly developing medical infrastructure, increasing medical tourism, increased spending, and increasing awareness amongst population in developing nations such as China, and India in this region. This report identifies the global solid tumor market size in for the year 2014-2016, and forecast of the same for year 2021. 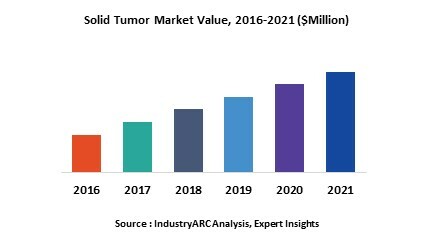 It also highlights the market drivers, restraints, growth indicators, challenges, and other key aspects with respect to global solid tumor market. 14.9. F. Hoffmann-La Roche Ltd.
14.13. Kyowa Hakko Kirin Co., Ltd.